Declines across categories of mail continue to cause gradual shifts to the U.S. Postal Service’s role in Americans’ everyday lives, according to data from the Service’s most recent Household Diary Study. Letter mail sent by households saw the steepest declines, hastening subsequent changes to the economics of the Postal Service’s business, because that product had previously posted the agency’s strongest transactional profits. Letter mail sent between households declined 31 percent between 2010 and 2015. Mail sent by non-households to households declined 5.6 percent. Even amid these declines, Americans households still receive enough bills in the mail each year — more than 10 billion — to stretch to the moon and back twice. Increasing package delivery volume, a top management priority, remains on pace. Households with annual income over $100,000 used it to receive a package a week last year. Meanwhile, a new research paper by postal economics experts Robert Cohen and John Waller concluded that the Postal Service’s stand-alone parcel routes are not profitable, and could even be losing more than $1 per package. In 2015, U.S. households received 119.9 billion pieces of mail and sent 10.5 billion pieces, according to the U.S. Postal Service’s Household Diary Study. Since 2010, total mail sent and received by households has fallen 10 percent. As mail volume continues to drop, changes to the composition of what is sent through the mail mean that the function of the Postal Service and the role it plays for American homes and businesses are also shifting. First-Class Mail accounted for about 40 percent of mail received and sent by households in 2015, which represents a decline of 8 percentage points over five years. This is vitally important to the Postal Service’s business model, because the agency reports higher cost coverage for First-Class Mail, 226 percent, than any other class of mail. 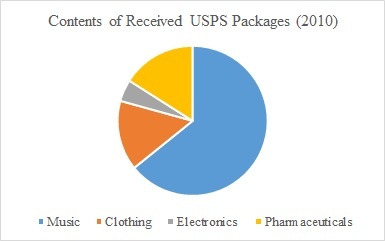 By contrast, Priority Mail packages, the Postal Service’s highly promoted competitive product offering, have cost coverage of just 126 percent. Major categories of business-to-household mail, including transaction mail and advertisements, continued to decline in volume. But these declines were not nearly as sharp as for personal mail. Mail sent between households declined by 31 percent from 2010 to 2015, while mail sent from businesses to households declined by 5 percent over the same period. As a result of these changes, advertisements comprised an increasing share, 62 percent, of all mail received by households last year. The average household sent 1.3 pieces of mail per week in 2015, a 57 percent drop-off from 2010. Personal letters sent and received by households fell 28 percent between 2010 and 2015. The volume of greeting cards sent and received was down 35 percent in 2015, relative to 2010. In that year, the average household received 0.8 pieces of household-to-household mail per week. By 2015, that figure had declined to 0.5. As letter mail volume continued to decline, the Household Diary Study indicated that the Postal Service’s campaign to increase its package shipping business appeared to be working. Households received 3.8 billion packages, not counting CDs and DVDs, in 2015 and sent 576 million, with growth in every package category. Total packages received and sent represented a little over 3 percent of total mail received and sent by households. Since 2010, shipping and package volume has increased by 1.1 billion pieces, or roughly 30 percent. “We continue to post double-digit gains in package volume,” said Postmaster General and CEO Megan J. Brennan. Postal Service leadership has looked to eCommerce-related deliveries for new business to drive this surge. The Household Diary Study found that the majority of packages received by households contained clothing, pharmaceuticals, music, and electronics. Consumers with higher incomes sent and received more packages. Households with incomes above $100,000 received almost three times the number of packages as those with incomes below $35,000. The wealthier group also sent twice as many packages as the lower-income group. Consumers with higher levels of education were also more likely to send and receive packages. Those who completed college received and sent more than twice as many packages as those who did not complete high school. More Americans pay their bills online than ever before. But American households still receive enough bills in the mail each year, more than 10 billion, that they’d stretch to the moon and back twice if placed end to end. Add bank and credit card statements received by households to that lineup, and the mail pile would reach the moon and back five times. In 2015, 22 percent of total household mail volume consisted of transaction mail — bills, statements, payments, donations, rebates, and orders. That’s a decrease of 3.7 percentage points since 2010. 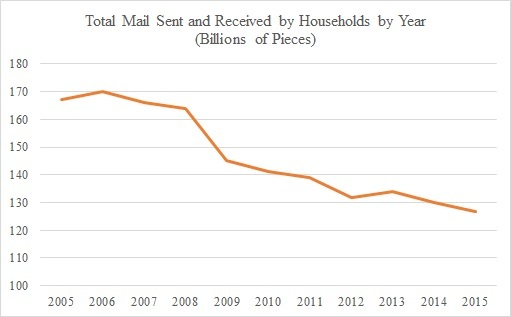 Households now send or receive 4.3 pieces of transaction mail per week — 1.6 pieces per week less than in 2010. The Postal Service attributes the decline in transaction mail volume to the Internet. Two-thirds of all bills are now paid online. Only 30 percent of all bills were paid by mail in 2015 — down from 47 percent in 2010. Younger households received and sent less transaction mail. The Study attributed this difference to the fact that younger households tend to more frequently use electronic alternatives to conduct their official business. The young are also less likely to own homes, insurance policies, or investments — all of which necessitate transaction mail. While wealthier households may be better equipped to conduct financial transactions online, households with more than $100,000 in annual income sent and received almost twice as much transaction mail as those with incomes below $35,000. Statements and bills represented about 44 percent of the First-Class Mail received by households in 2015 — the same share as in 2010. The total number of bills and financial statements declined sharply over that period. Stand-alone Parcel Delivery: A Doomed Business Model? In a new research paper, The Postal Service’s Cost to Deliver Parcels on Letter Routes and Parcel Routes, postal scholars Robert Cohen and John Waller determined that delivering parcels on stand-alone parcel routes was not profitable for the Postal Service. Cohen and Waller observed structural differences between letter routes and stand-alone parcel routes. USPS has an established structure for letter routes that drivers consistently follow. Stand-alone parcel routes, on the other hand, have no fixed structure. Instead, the route is dictated by which houses or businesses are to receive deliveries on a given day. Based on the Postal Service’s 2015 cost methodology, Cohen and Waller estimated that the average cost of delivering a competitive product was 40 cents when delivered on a letter route. These parcels contributed about 44 cents each toward institutional overhead. With the same data, Cohen and Waller estimated the average cost to deliver parcels on stand-alone parcel routes at $2.17 per parcel — more than quintuple the 40 cents per parcel on letter routes. If each piece generated the average amount of revenue, then the Postal Service would lose $1.33 on each piece it delivered on a stand-alone route. These findings suggest that the Postal Service should seek to deliver as many packages as possible on existing letter routes. On the other hand, this research could also be taken to show that the only way the Postal Service can profitably grow its package business is by using revenue from the delivery of First-Class Mail to effectively subsidize its activities in the highly competitive package delivery market — a practice explicitly prohibited by federal law. Federal law charges the Postal Regulatory Commission with ensuring that competitive products, like parcels, are not subsidized by other Postal Service products protected by its statutory monopolies, including for First-Class Mail.